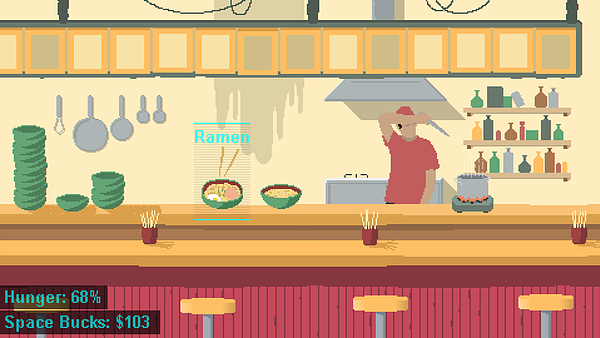 As a RPG taking place in an 8-bit universe of hoverbike jockeying, Desert Child maintains a chill, ramen-fueled vibe while pushing players to climb the ladder in an unforgiving rat race. With a Kickstarter campaign in full swing, I chatted with dev Oscar Brittain on project development and the nuances therein. 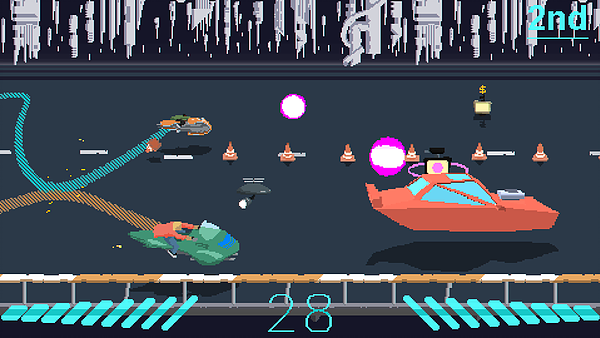 Erik Meyer: You describe the game as (to paraphrase) a racing RPG set in a dusty world of vintage hoverbikes, a pixel-art solar system inspired by Cowboy Bebop, Akira and Redline. So the meat of the game comes as a high-speed souped-up chase to the finish line, a track laden with obstacles, races that threaten to bankrupt the losers. But the game includes other elements like bounties, buffs by interplanetary cuisine, drug trade, and so on, so let’s speak to that a bit. As you weighed these additional game elements against the existing game world, what made a specific activity ‘feel’ right? How do you see these disparate elements working in concert? Oscar Brittain: So, the game is broken up into three pretty distinct acts, with the first and third focusing mainly on racing. The middle section of the game deals with a bunch of different gameplay styles and narrative threads. The visual language of the game remains consistent throughout but during this middle act gets juxtaposed with some darker elements. In terms of what felt “right”, it’s hard to pin down. Most of the design choices are ultimately guided by the direction the world and art style took. I like to think of game design as a back-and-forth between the narrative and the mechanics; what are you trying to say, then what dials are you turning to help the player feel that way? There’s no point in development where I say, “Well, it would be easier for the player to just skip all this narrative context”, because without that, even the best parts of a game lose a bit of their life. You need the mechanics to grow out of your narrative goals, and vice versa. EM: The ability to customize (and improve) vehicles by way of guns, amplifiers, and bumper stickers gives players freedom to personalize their experiences. From a development perspective, describe striking a balance in the spectrum between completely prescribed playthroughs and over-the-top crafting options. What strikes a place of satisfaction, and how do you pace options through gameplay? OB: Honestly, I love the idea that people spend enough time in some games that they can completely break them. I think the best way to balance something like that is to point players toward a very specific goal, then give them all the different toys. It’s when you let their end goal get fuzzy that people start to notice the man behind the curtain, if you will. If you don’t give people some context for their actions, they start to just try everything, which can ruin the game for them. My job as a designer is to make sure the player always has something to do, and something to do it with. Not the case for all games, but definitely something I adhere to. EM: Pixel side-scroller racing games like Excitebike set precedent for titles that offered something new to the public in decades past. With games like Mario Kart existing alongside run-and-gun platformers (Cuphead, for instance), what comes as the biggest development challenge in translating creative ideas and engaging an audience? What expectations do you have to work against? EM: You note the game has gone through many iterations, and in terms of other personal influences, you include Shin Takamatsu, Italian futurism and 36 Chambers, not to mention a list of iconic game titles. Describe the fits and starts that led you down different roads, and what takeaways came from those different versions of the project? While people who come to Desert Child on social media or Kickstarter see a polished presentation, how did the details come together, and do you see the project as better for the long development time? 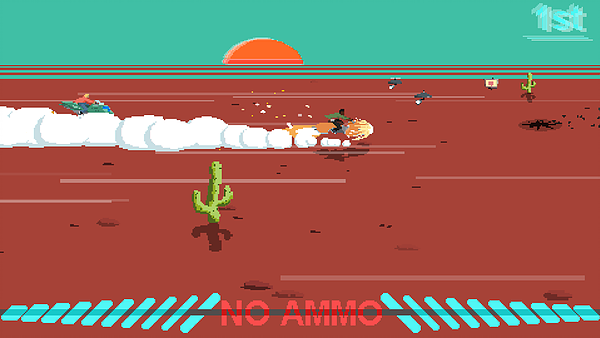 OB: Well, the game was originally a top-down space shooter, focused on bounty hunting. I had the vision of, “the space sim to end all space sims”, which I think is a misstep basically every developer makes at some point. 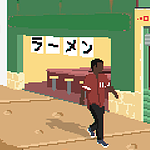 I knew I wanted the gameplay to be varied, and I realised the more I magnified the cityscape and its character, the more I could tie together the disparate elements of the game, like eating food, taking different jobs, etc. The closer people got to these parts, and the less abstracted they were, the more people appreciated that they were an integral part of the experience, not just some side filler in an open-world game. So I focused player expression onto something I knew would actually have an effect on their experience (customization), rather than just giving them the freedom to fly around the solar system for no reason. It comes back to what I was saying about goals getting fuzzy and people start to see through the magic. 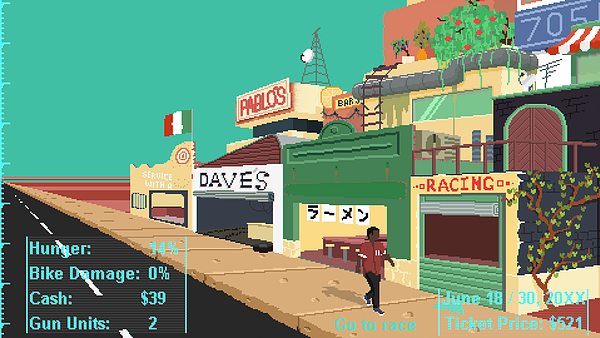 EM: The game’s story describes a broke young racer who fighting through gangsters and bounty hunters, having just left a ruined Earth, noting that everything comes at a price. But unlike that gloomy message, the game’s art and architecture are bright and colourful, reminiscent of the American Southwest. Similarly, while the racing life involves mean streets, the music, food, and other surrounding elements are rich and playful, so I’m interested in this contrast between the visual aesthetic and the plight of the main character. Do you see these as working in concert? OB: You can be in a bad situation, but you’ll still try to find the best in it. I think it’s seeing that there is good and prosperity immediately around you that can inspire a person to not give up. I mean, the player didn’t build the city, people who were happy to be living there did. I sometimes think it’s weird how we always depict the post-apocalypse as this horrible wasteland, yet we clearly love it. Wouldn’t we make it nice if we actually ended up there? EM: At some point in any game’s production, the developers have to make big decisions, such as how to pay the bills, what engine to use, and how to give the public a taste of the title, prior to release. In your case, you’re currently under way with a funding campaign on Kickstarter (to finish Desert Child), used Game Maker: Studio, and have a demo for curious persons to check out. Given that you have more than a decade of experience working with the tools you’re using, as well as the fact that you took your project to Indiecade @ E3, describe these big decisions and what the deciding factors were. What made you go with Game Maker: Studio, not Unity or LÖVE or a different engine? As you’ve put your project out into the world, what kinds of preparation and research have come along for the ride? OB: So, for the engine question, it just ended up being easier to implement the game’s faux-3D effect in the races. Unity is great for 3D, but after a few tests I found it wasn’t as good at bending the rules like I could using a 2D engine. Taking the game to Indiecade @ E3 was kind of a no-brainer, I mean, it really legitimizes what you do to friends and family who have actually heard of E3. Obviously, it’s an awesome way to show off the game, too. For preparation and research, I’ve experimented with a tonne of tools, settling on Game Maker, Asperite, Paint of Persia, Photoshop and Ableton Live. They all get the job done perfectly. I’ve looked into, and spoken with, a bunch of different platforms to bring the game to, but you know, that’s always ongoing. EM: In years past, hardware constraints limited the number of enemies that could exist on-screen at any given time, and things like screen size very much followed the medium (TV vs. computer, etc). At this point, you have a great deal of freedom in these areas, but you also don’t want to overwhelm gamers with visual/audio information at any given time, so as Hi-Bit games succeed on Steam and other platforms, what do you see molding the look/feel? Are we simply experiencing a nostalgia for retro titles? OB: I don’t know if there’s many people still feeling nostalgia for pixel art. I mean, we’re at around a decade of mass-market exposure to indie games, so I think most people have had their fill. Now, I think people are just looking for new and exciting ideas, regardless of what they look like. If anything, it’s more liberating now, since people seem more open to different ideas, rather than developers having to pander to some nostalgia trend. EM: As you take and expand the game, filling in cities like Mullahoe, New Olympia, and Europa Uno, what parts of your process feel like business as usual, and what parts continue to present new wrinkles? With coding, graphics, audio, social media, and Kickstarter campaign challenges, what does your next month look like? OB: It looks busy. The game has to have a demo ready for Fantastic Arcade, the Kickstarter needs to be run well, and I still need to sleep. I don’t think any part of this game has/will be business as usual. I’ve really been pushing myself to make sure every part of the game feels like something fresh and new; I don’t want it to feel like any other game.